Matar Paneer is the ultimate comfort food. It is one of those Indian curries that can be devoured during any time of the year. And for the nation that is obsessed with local cottage cheese aka paneer, matar paneer is one of the most loved curries. It compliments all kinds of Indian bread – flat, deep-fried, baked and almost all variety of rice dishes. 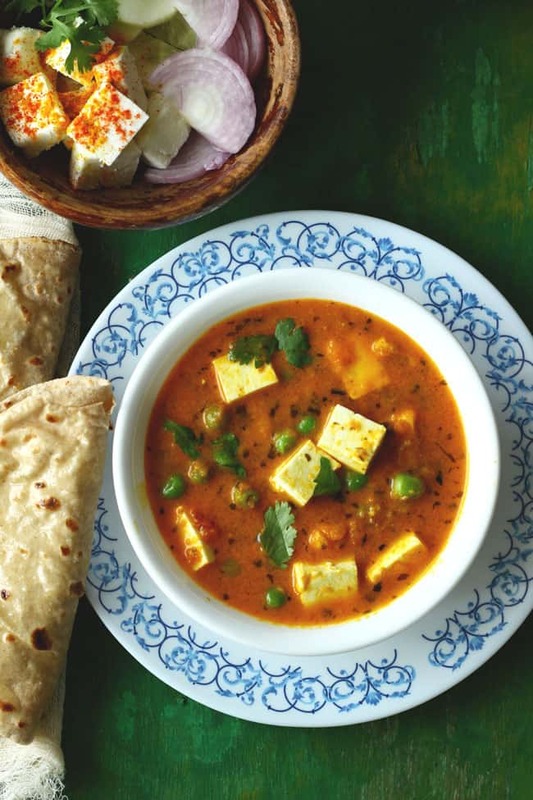 This Matar Paneer Recipe is definitely worth bookmarking as it is super quick to prepare. Why? Because it’s done in the pressure cooker. 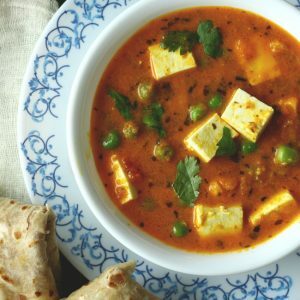 Why To Cook Matar Paneer In Pressure Cooker? The Matar Paneer cooked in the pressure cooker has a thick, luscious texture to it and turns out delicious. One reason to use the pressure cooker is quick and even cooking. Second, the gravy and the peas and the paneer all get synced so beautifully after a whistle or two in the pressure cooker. 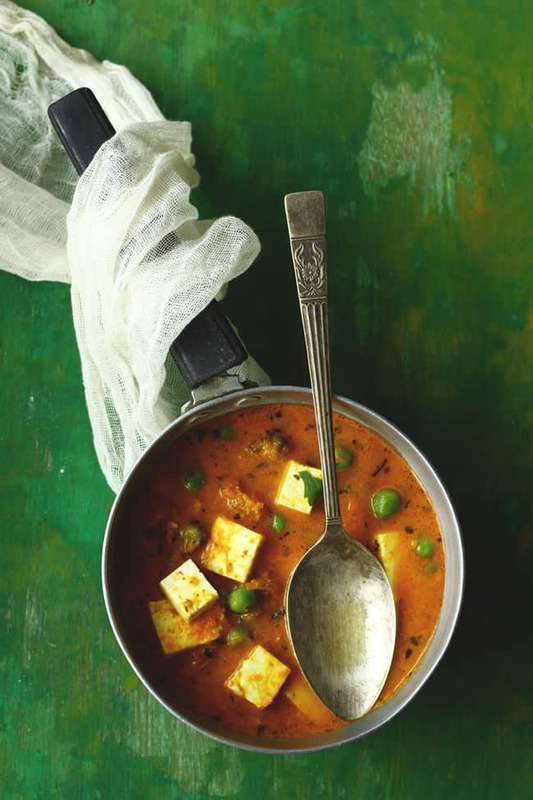 For me, the crowning glory of Matar Paneer is the spicy, semi-dry gravy. And when cooked in the pressure cooker I get the fancied result. I could happily enjoy it for lunch and the dinner along with steamed rice. It has a simple onion and tomato base yet it tastes so distinct and finger-licking good. Every family has their own take on Matar Paneer. I am not claiming that this is how an authentic Matar Paneer is done. The Punjabi Matar Paneer is the deduction of my cooking observations gained at different Sikh households over a period of time. Eventually, I made my moderation to the recipe to get the desired result. Many people prefer using finely chopped onion for the gravy instead of the paste. I often do that too. But if I am too lazy to chop the onion then the onion paste is the best solution. Does it make any difference to the gravy? Yes, it does. The gravy done with the chopped onions is bit coarse and rustic in texture, while the other one is more of a restaurant style. So take your pick!! 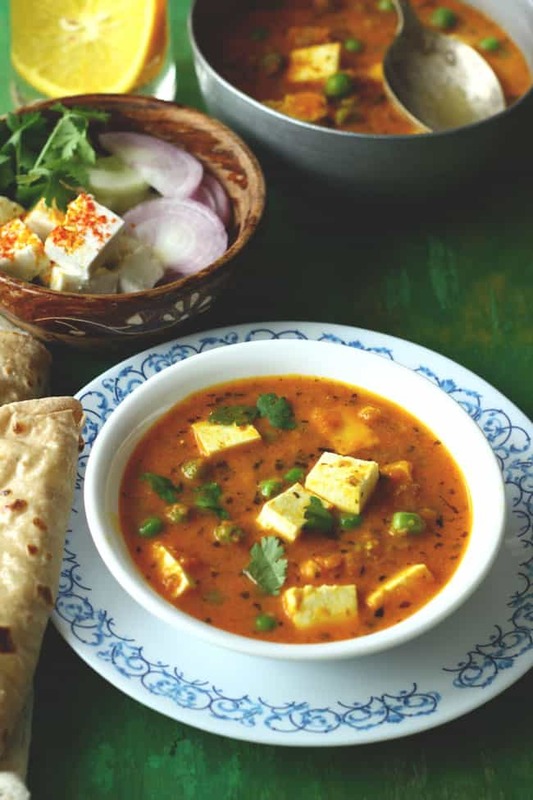 I am not a huge paneer lover, but I too have my certain favourites – Kali Mirch Paneer, Matar Paneer, and the Paneer Butter Masala. I think I prefer paneer curries with a creamy texture and the mild spicy tone. Too bold paneer curries are not my thing. 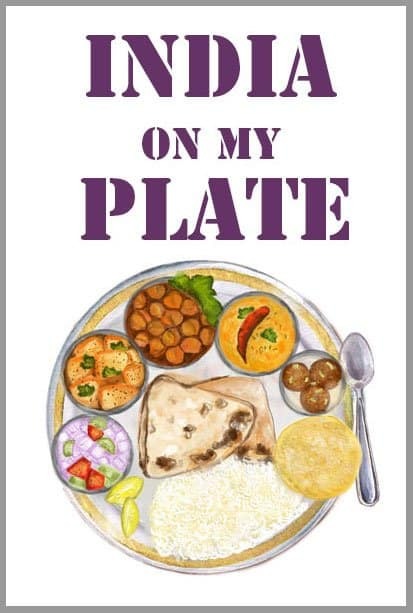 Serve Matar Paneer or any other paneer curry with hot chapati/paratha/naan, jeera rice/pulao, raita and the green salad. These elements together make a stunning Indian meal, you must try this combination. 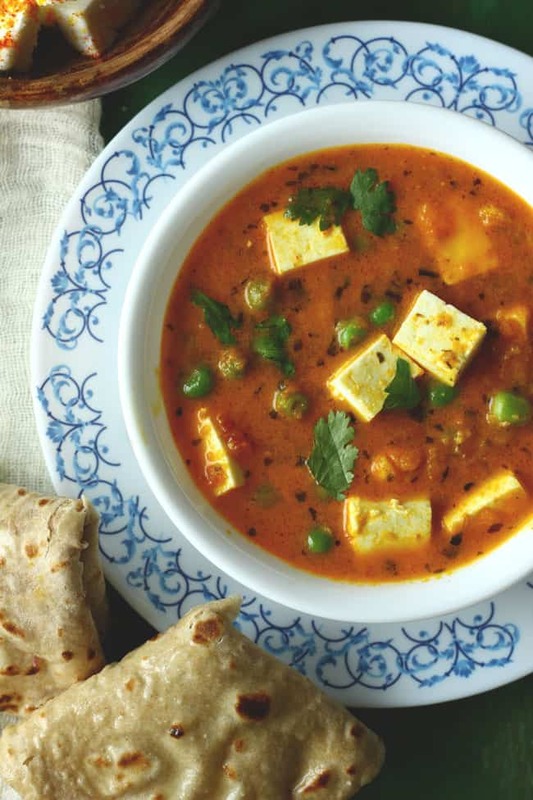 Matar Paneer is the ultimate comfort food. It is one of those Indian curries than can be devoured during any time of the year. Blend together the onion, garlic, ginger and green chili to a smooth paste. Heat oil in a pressure cooker ( buy it here ) over medium flame. Add the bay leaf and cumin seeds. Fry till aromatic or for 10 - 20 second. Add the onion paste and fry till it turns light brown and leave the sides of the cooker. Keep stirring the paste while frying to avoid it getting burnt. Now add the grated or pureed tomatoes. Fry for a minute. Add the salt, spices and the garam masala. Fry till the masala comes together and leaves the sides of the pan. This takes 5 - 10 minutes over low heat. Keep stirring the masala while roasting. Add the peas, paneer and one cup of water. Seal the pressure with the lid. Cook the curry over low heat for 1 - 2 whistle. Turn off the heat. Let the steam release naturally from the pressure cooker before opening the lid. If the curry seems too thick add little bit of more water and simmer the curry for 5 more minutes. Add kasuri methi and stir to combine. Garnish with chopped coriander leaves. 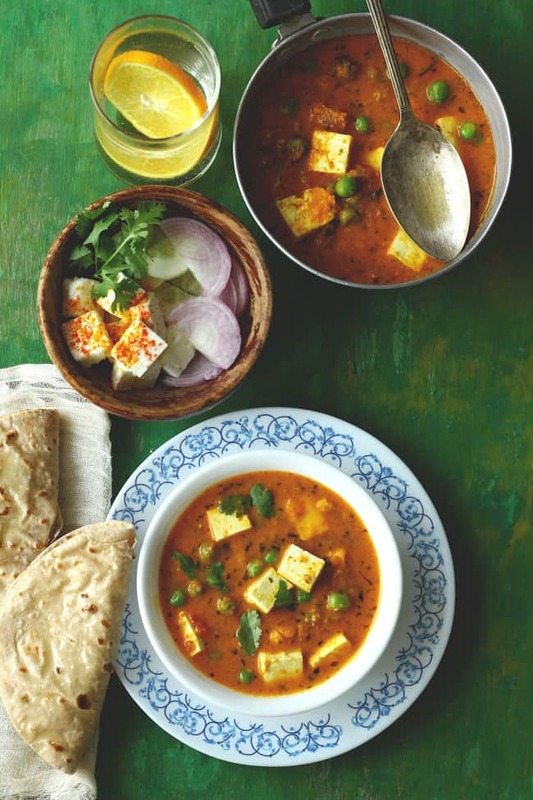 Serve Matar Paneer warm with chapati or rice. I have always prepared matar paneer in kadai to preserve the richness. Will give the cooker a shot now!